Propane is a hydrocarbon (C3H8) that is produced from crude oil refining as well as natural gas processing. In the 1990 Clean Air Act, propane was approved as an alternative clean fuel which was reinforced by the National Policy Act of 1992. Propane is nontoxic and colorless. It is used by more than 14 million families to fuel furnaces, water heaters, outdoor grills, fire places, pool heaters, dryers, range tops and now alternative fuel for vehicles. 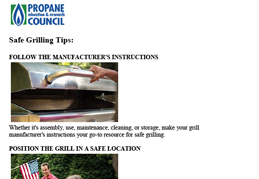 Propane is easy to transport and can be used in areas beyond the natural gas mains. Your home propane has been odorized so that you can smell it. Always smell around for gas before lighting your appliance. Get everyone outside and away from the gas equipment. Shut off the gas supply, using the shut off valve at the tank or cylinder. Call your propane supplier – use your neighbor’s phone if gas smell is in the house. If your gas control has gotten wet as the result of flooding or other wetting, it must be replaced immediately by a trained gas service technician. Never tamper with or use force or tools on the gas control system. If the gas control knob will not operate by hand, the control must be replaced. By Federal and State regulations, underground propane tanks should have protection from corrosion. This is called Cathodic Protection and it’s achieved by attaching the proper amount of anodes to the tank when it is installed. This protects the tank from corrosion caused by the soil. NEW REGULATIONS call for periodic inspections of those anodes to insure they are doing their job of protecting the tank and your family. Inspections are required every three years. Call County Propane now. Corrosion is an aggressive form of rusting and rust to a steel propane tank and metallic piping can be fatal. As steel ages it begins to rust. Some rust is superficial and of no serious concern. However, if the steel is in a bad environment such as wet ground containing natural or manmade chemicals, the rusting process accelerates. This is what we call corrosion. Over time the corrosion causes structural problems, creating pits or holes in the steel. If ignored these holes may leak, releasing propane into the ground. The concern is that the leaking propane can migrate into a crawl space or basement of a building. Corrosion can virtually destroy a propane tank or piping and leaking propane is potentially dangerous. If you have not had this inspection done call County Propane and we will conduct this test. If your anodes pass, everything is fine. If the testing results show that the Cathodic Protection is ineffective, they would have to be replaced. Corrosion can be defined as a disease of steel. Coating the steel tank like many of the manufacturers do in the factory is the first line of defense against corrosion. The length of the protection measured in years is dependent on the severity of the environment in which the tank is installed. If the tank is installed in non-corrosive, dry, sandy soil it may be relatively free of corrosion and the anode could last a lifetime. However, if the tank is installed in wet, fertilized and sticky clay, the anodes could possibly be consumed in less time.